AISECT University: Vijaykant appointed as VC- Mr Vijaykant verma appointed as the first VC: Mr. verma is senior Electronics & Communication Engineer who has worked in India & abroad on important positons. He has shown confidence that Aisect would emergence the quality education centre. Mr. Vijay Singh appointed as the Registrar of the University. The Higher Education Minister Shri Jeetu Patwari, while inaugurating the 2 day Career Opportunities Fair under the Swami Vivekanand Career Counselling Scheme said that higher education and employment is a big challenge. Country is progressing but jobs are diminishing. It is our joint responsibility to ensure eradication of this problem. Coordination in demand and supply is must. He further stated that career fairs should not become mere formality. Make it a medium to help unemployed receive employment in real sense. Shri Patwari said that we have to ensure that whether the present curriculum of higher education fits in todays competitive examinations or not. It is must to bring change in this system. Students will get right direction through counselling under the career fairs. He informed that as per the intention of the Chief Minister, a policy is being prepared to ensure 100 day employment in a year to urban unemployed youth through Yuva Swabhiman Yojana. The Principal Secretary, Higher Education, Shri Neeraj Mandloi said that there is a need to include curriculum of competitive examinations in universities courses. Work is being done on this matter. He mentioned that the government is making efforts in the direction to ensure that students should not face difficulty in receiving costly coaching. Meeting of General Council held A meeting of General Council of Institute for Excellence in Higher Education, Bhopal held under the Chairmanship of the Higher Education Minister Shri Jeetu Patwari. Detailed discussions in connection to increase in remuneration of manager and attendant of girls hostel, remuneration of honorary teachers, outsourcing services, remuneration of guest teachers for B.Sc. Forensic Science, B.Com. 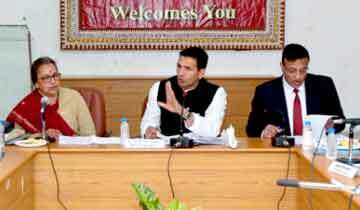 Computer Application and B.com Taxation to be introduced from 2019-20 academic session and for conducting courses regularly took place in the meeting. The Director In-Charge of the Institute Dr. Mira Pingle and officers of various departments were present at the meeting. The fair is being organised under the joint aegis of Institute for Excellence in Higher Education and Sarojini Naidu Government Girls College. As many as 70 stalls have been put up at the campus of institute. Major companies like Vardhman, Lupin, Azim Premji, Zomato are taking part in the 2 day fair. The Career Counseling Committee (CCC) is a Non standing Committee of the Institute of Chartered Accountants of India through its Career Counseling Committee (CCC) constituted under regulatory provisions of The Chartered Accountants Act, 1949 to promote the Commerce Education with special focus on CA course amongst Secondary, Senior/ Higher Secondary, Graduate/Post Graduate students as well as other stakeholders. In order to popularize Commerce Education, the CCC of ICAI conducting ICAI Commerce Wizard -2016 i.e. an aptitude and diagnostic test to measure the concept of understanding the ability of a student in commerce. Students of Class IX/X/XI/XII are eligible for the aforesaid test. The aforesaid test will be conducted in two levels, In level 1 test i.e. on line test the candidate can appear from his home or any convenient place through their Laptop/Desktop/Mobile/Ipad etc. and In level 2 of this test will be held at designated Centre through Printed Question papers & OMR answer sheets for shortlisted candidates of level 1 as decided by the Test Management Committee. Candidate may register in the same by paying Rs 100/- & filling up the form online through websiteicaicommercewizard.com and After due date, candidate may register by paying Rs 150/-. More than 1 million cash award is slated for the meritorious candidates and the candidate appear for level 1 & 2 test will get the participation certificate. For other Details & Registration, please visit icaicommercewizard.com, For any clarification, please contact at Email: commercewizard@icai.in, mobile: 09312085025. CA. Mukesh Singh Kushwah, Chairman, Career Counseling Committee (CCC), ICAI is leading from the front for smooth conduction of the ICAI Commerce Wizard-2016. Higher and Technical Education Minister Shri Umashankar Gupta released magazine �Pratibha 2014-15� of Government Hamidia Arts and Commerce College here today. College principal Smt. Sudha Singh and editorial board members were present on the occasion. 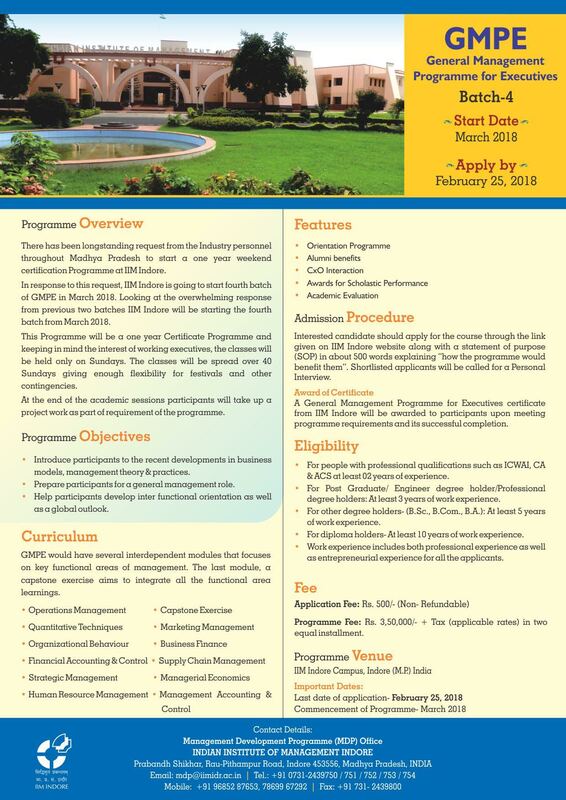 Centre for Research and Industrial Staff Performance, (CRISP), Bhopal has been established in the year 1997 as a Society under the Indo �German Technical Cooperation agreement. 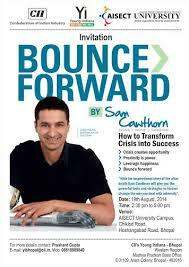 Young Indians (Bhopal Chapter) is organizing a motivational session on ��Bounce Forward�: How totransform Crisis to success by World famous speaker Sam Cawthorn, CEO, Empowering Enterprises, Author, Speaker, Philanthropist, Expert & Thought Leader in Resilience & Turnarounds on 19th 2014 at 1430 Hrs at AISECT University,Bhopal A copy of invite is attached. Private sector employment increased by 192,000 jobs from December to January, according to the January 'ADP National Employment Report', which is produced by ADP, a leading provider of human capital management services, in collaboration with Moody's Analytics. The report, which is derived from ASP's actual payroll data, measures the change in total nonfarm private employment each month on a seasonallu adjusted basis. The December 2012 report, which reported job gains of 215,000, was revised downward by 30,000 to 185,000 jobs. -> BUSINESSES with 49 or fewer employees added 115,000 jobs in January. Employment levels among medium-sized companies with 50499 employees rose by 79,000, while employment at large companies those with 500 or more employees fell by 2,000. A Imost a third of workers in India (31 per cent) report that they have to sacrifice sleep to fit in personal and work commitments, either by waking up too early or by burning the midnight oil, according to a Regus study. Although flexible working is highlighted as a way to reduce commuting, creating more hours in the day for sleep oor family life and improving productivity and staff retention, only 60 per cent of firms are rewarding management for encouraging the creation of a flexible workforce. -> Currently, the management is being rewarded for encouraging a flexible work environment in 60 per cent of firms. Some of the vital challenges of Indian businesses today include identifying new growth platforms, markert discontinuities, strategic innovation and leveraging diversity. In an exclusive event, 'Reverse Innovaton Meets Medici Effect', SHRM India and Customer Lab brought together the biggest innovation gurus, Vijay Govindarajan and Frans Johansson, to give insights on ways to address these problems. 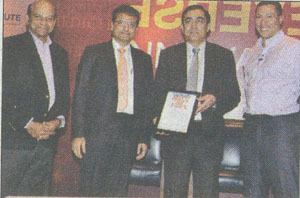 At this event, SHAM India and CustomerLab recognised companies, who have done outstandingly well in five key areas. Chosen out of several companies exemplified innovation by taking risks and breaking new ground in:innovation strategy; innovation culture and organisation; execution excellence; innovation protfolio management and ideation and creativity management. A rigorous assessment evaluated organisations on their performance across these five key areas. After an initial online application, the screening panel validated company data and requested for supporting documents, data, metrics and anecdotes where relevant. An eminent jury then scrutinised each application across 23 processes of innovation to come up with a list of winners. 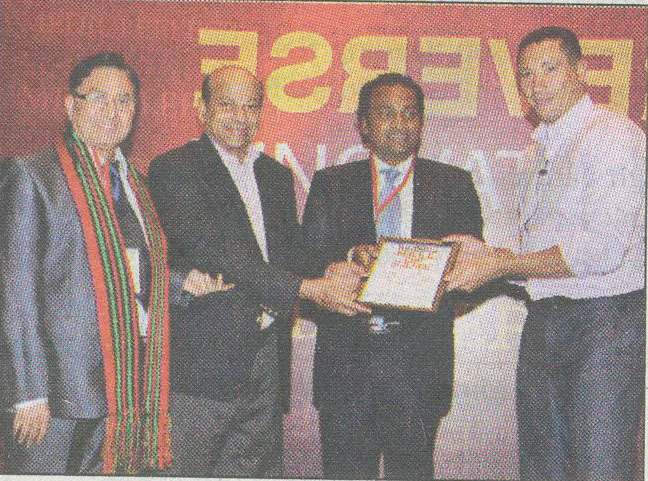 The award plaques were handed to the winning organisations by Vijay Govindarajan, professor of international business, Tuck School of Business, Dartmouth College and Frans Johansson, founder and CEO of The Medici Group. 1400 delegates, 14 international speakers - what else could an HR enthusiast ask for? The 16th National Conference 2012 of National HRD Network was an event that succeeded in more ways than one. The Hyderabad International Convention Center (HICC) was a beehive of activity from 29th November to 1st December 2012 with sessions being held across three different halls. S Y Siddiqui, COO (HR, finance, IT, company law and legal), Maruti Suzuki Limited stressed on the need to build a talent pool, five-ten years from now. He spoke about the need to restrain poaching talent as was agreed by automobile companies. He recalled the close support provided by the HR fraternity in the aftermath of the unfortunate incident at Maruti's Manesar plant. Dr.T V Rao, a veteran HR professional and founding member of National HRD Network took the audience through the journey of NHRDN. He stressed on the need for knowledge-dissemination among the HR fraternity. Arun Maira, member, Planning Commission spoke on how one could energise and take the nation to a state of excellence. He was of the opinion that employees need to have the right to participate in the way the enterprises are run. India needs to be an inclusive economy and Maira's vision was to have a million entrepreneurs in the future. D Shiv Kumar, MD & SVPIMEA, Nokia was of the opinion that HR as a department cannot be outsourced and said that the search for a safe harbour ends with HR. Kumar indicated that it was time to push for more cross-functional teams and there was an urgent need to addrass mediocrity. A fair reward system, openness, transparency in communication and recruiting right the first time, are the other essentials. Amitabh Chaudhry, MD and CEO, HDFC Life commented that leadership is one of the most observed and least understood phenomenon on earth. The competence of a leader as per Chaudhry can be judged by what happened to the organisation, post the departure of that person from the top post. On working across geographcal boundaries, Yogi Sriram SVP. corporate HR, L&T Limited emphasised that companies need to think of local requirements and be sensitive to local customs. Sriram felt that no single formula works across the world and it has to be an amalgamation of cultures, discipline and value systems. The highlight of the conference was the speech by former President, Dr A P J Abdul Kalam on the conference theme - Energizing Ex- cellence. Drawing parallels from his professional life in the missile and space sector, Dr. Kalam had the full house in rapt attention. He called for leaders to aim for credibility of excellence in a synergised model. 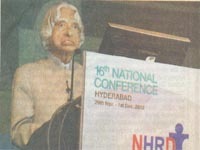 Dr Kalam remarked that today's leaders muat invest and create their own paths in unexplored territories. He said that leaders should be able to handle success and failure - with the ability of take quick decisions. He narrated the story of the early days of the satellite launches from Sriharikota and brought forth the view that leaders should take blame for failures and give credit to the team at times of victory. Rajeev Dubey, president (group HR, corporate services, after market) and member of the group executive board, Mahindra and mahindra Ltd spoke on creating tomorrow's companies by unleashing the human potential. Anand Pillai, Sr. EVP and CLO, Reliance Industries Limited remarked that the time has come to catch people doing things right rather than the old methodology of catching them wrong. All in all, it was a mosaic of messages for HR professionals from seasoned veterans and industry leaders, and they took away valuable learnings. Alarmed by a finding that only 15 percent of engineeringgraduates passing out from Indian colleges are employable, Fourth Dimension (4D)announces Bhopal’s first finishing school for engineering graduates launcheshere today. Fourth Dimension is a pioneeringinstitute which aims to become most quality driven and recognized authority onpersonal breakthrough by delivering experiential, value driven and resultoriented training. Mr.Swapnil Jain, CEO, Fourth Dimensionsaid “Fourth Dimension provides reskilling and upskilling programs for freshengineering graduates from colleges and universities to make them job ready by honingtheir skills in a way that prepares them to enter the industry environment withconfidence and pertinent knowledge”. Ms.Shalini Manoj, Director, Fourth Dimension said “There is a huge gap between therequirement of the industry and availability of talent possessed by our engineeringand management graduates. Our aim at Fourth Dimension is transform younggraduates from job seekers to job providers. The target group is the youngpopulation of Bhopal who has the real energy to make this aim realty”. 4D aspires tonurture human talent into proactive professionals. It has a pool of world classtrainers, student centric approach, multiple intelligence concept offerscustomized and need basic training for each individual student resulting inrevolutionary sure shot results. The USP of 4Dprogram is delivery mechanism inspired to create brand icons in the industry.The basic plan of the program is to create a brand identity of each student byadding quality at every touch point. It is a one stop preparatory institutewhich caters to all your needs at unbelievable low prices. Hindi University will be established in Bhopal. A sub-committee formed for constitution of the university met here today. The committee discussed the draft bill for formation of the Hindi University. While addressing the meeting Higher Education Minister Shri Laxmikant Sharma said that setting up of the Hindi University is in the priority list of the state government. He appealed the members of the sub-committee to finalise the draft bill at the earliest so that the university can be established without delay. Shri Laxmikant Sharma said that the revenue department has been requested to allot land for setting up the proposed Hindi University. The government is trying to get the land marked for the university at the earliest. Head of Department of Rajasthan University Prof. Madhukar Shyam Chaturvedi, Prof. Shri Mohan Lal Chheepa, Rani Durgavati University Vice Chancellor Dr. Ram Rajesh Mishra, Hindi Granth Academy Bhopal Director Dr. Govind Prasad Sharma and coordinator of the sub-committee and Commissioner Higher Education Shri Rajiv Ranjan were present. The sub-committee also discussed about the faculties to be started in the university. Subjects like Hindi Literature and Language, Religious Science, Social Science and Arts, Commerce & Management, Science and Technology, Ayur Vigyan, Law and Agriculture etc will be opened. These subjects will be opened in a phased manner as per availability of Hindi syllabus and textbooks in Hindi. The sub-committee also discussed about the financial side and the necessary posts to be created. The aim of the Hindi University is to impart knowledge and education in Hindi and giving a boost to Hindi language. The Hindi University will also undertake study and research in culture and tradition. 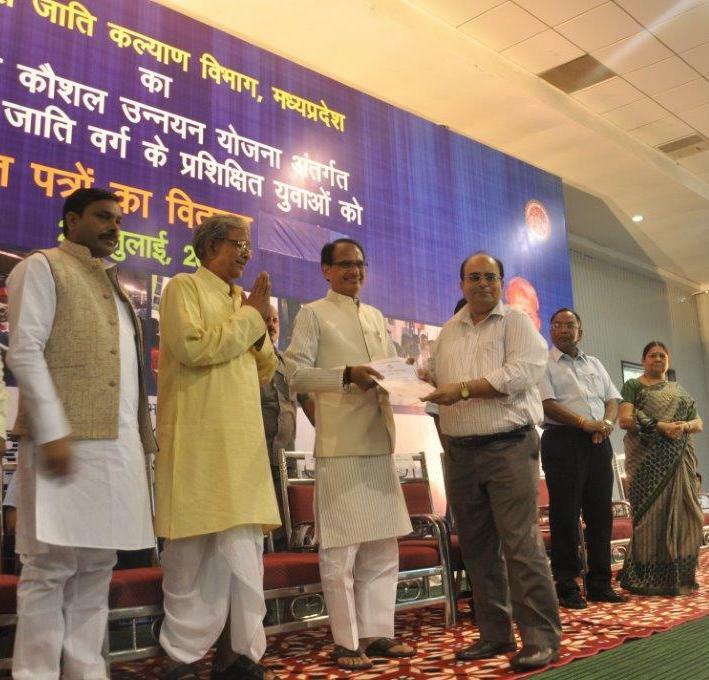 The whole Madhya Pradesh state will come under Hindi University. Chief Minister will be the chairman of the General Council and Higher Education Minister will be vice-chairman of the General Council of the Hindi University. Pathfinder, the MBA entrance training institute, has given number of selections from Bhoapl in IIMs. To encourage this number a free national level Mock CAT test is going to be organized by Pathfinder. Around 10,000 to 15,000 students from almost 25 different cities would appear. This test based on the latest pattern will benefit the students and will provide a chance to rate them at the national level against this competition. Don't intervene while somebody speaks, let him finish his turn. If the topic doesn't lie within the purview of your knowledge, be calm & increase the volume of your knowledge by listening. Life is nothing but another name of "Self-confidence." The more confident you have the more competent you are to achieve anything, but just like "gold" confidence is also rare in this world. If you are with confidence you are certainlly to be known rich even though you are not with money. It might not seem pleasant to say but this is ground reality that like "gold" confidence doesn't exist everywhere. If you have confidence, it only means that your personality has reached at some particular height. The stability of self-confidence can be measured with different measurements. For some, can sustain their self-confidence for a long piece of the time whereas some people fail to do it even for some seconds. . This is different thing that in such shameful situation, they, only to exhibit their unreal self-reliance , behave with ultra-self-confidence or act clownishly. Wine or such kind of other intoxicants help you damage the three main bases of your own reliance or self-confidence. These three bases are - your strength of meditation, your self-generated impetus & the hidden personality of yours. The genuine self-reliance is really such a stationary & never shrinking treasure, which will continue to benefit you forever. Self-confidence is a prosperous, innate & fragrant positive thought, beauty & energy whereof fragrance, thought & energy touch not only to you but also to them who are indirectly familiar with you or accessible for you by your doings. Self-confidence can be classified into two kinds. Firstly, it is innate self-confidence, which is obtained from the healthy atmosphere of your own home & the guiding behaviour of your parents & relatives. Secondly, it is unsubstantial self-reliance, which is born in the atmosphere full of hypocrisies & selfishness. Social gatherings, parties are best mediums to examine one's self-confidence. Though, simplicity & informality must be maintained on such occasions, it is often not possible. First, you must have confidence to hold a function or a party & be sure of the arrival of the invited people. Secondly, in the party, you should talk to them who are more handsome, attractive than you are or they are more confident than you are. Thirdly, you are even this much confident to leave the party at the moment when you have become the central point of attraction in the function. If we talk of extremity, only martyrs had the greatest amount of confidence with them as they had no fixed time to die. Though this case can't take place in parties, if you have lost confidence you are bound to loose a lot. If you are deprived of confidence your life will turn much hard. Nevertheless, we can, by efforts, acquire it; & enjoy it.